Disney has a food site called Babble (www.babble.com), and every once in a while they come up with some clever food-related ideas. 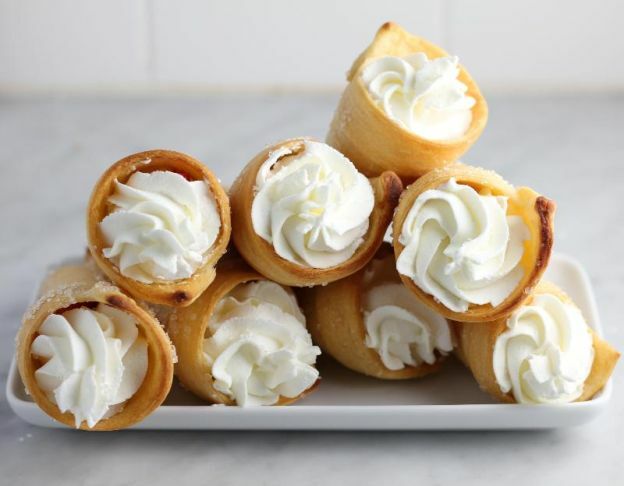 One they just posted was how to make a delicious and fun, hand-held dessert from refrigerated crescent roll dough. She calls them Berries ‘n Cream Cones. And what I loved about her idea was that these are so easy to make. 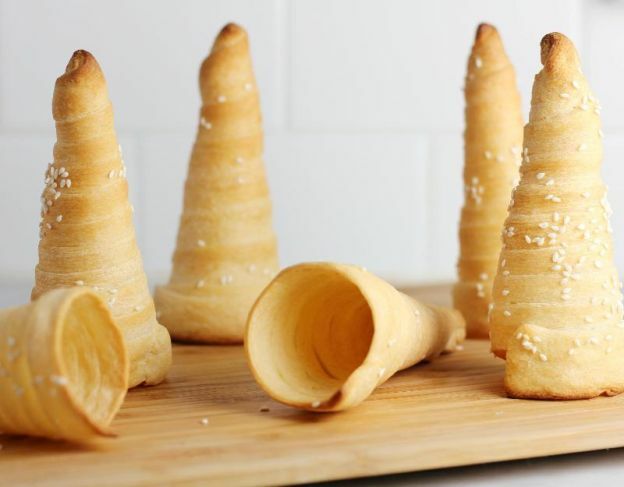 A can of crescent roll dough (a national favorite “shortcut” ingredient, by the way) makes short work of these adorable, edible cones. 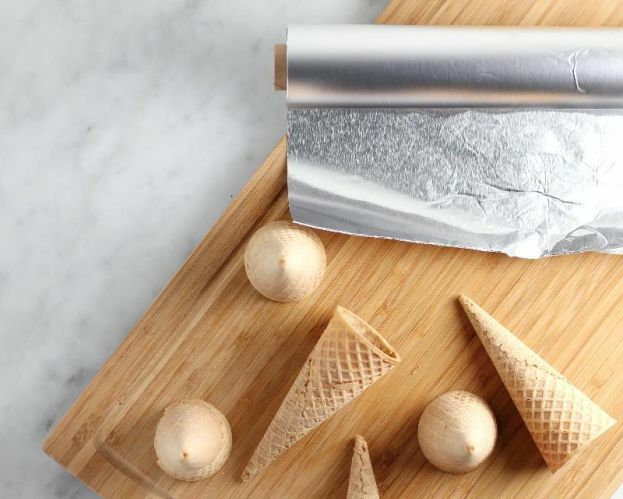 To start, you need a box of sugar cones and some tin foil. 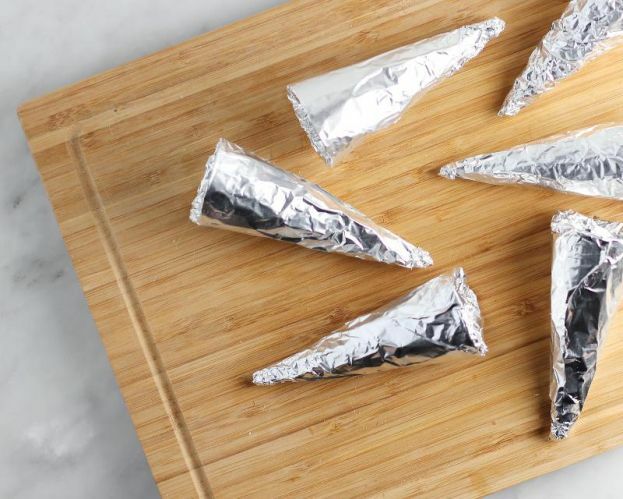 Then wrap the cones well in foil and lightly spray them with non-stick cooking spray. Line a baking sheet with parchment and preheat your oven to 375°F. Next, open your can of crescent dough, unroll into a large rectangle and gently press the dough to remove the perforations. 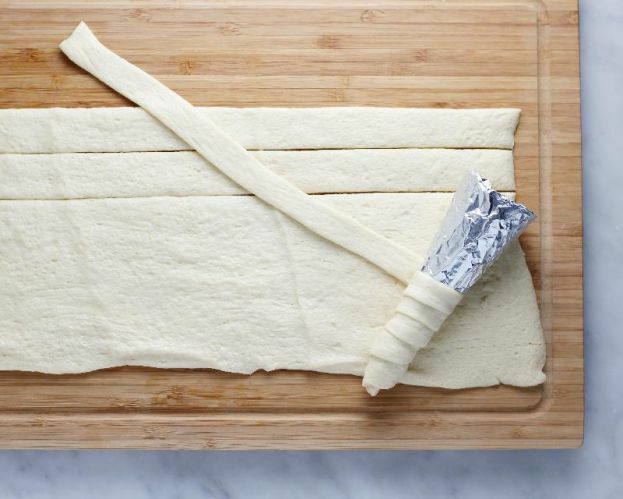 Using a sharp knife or pizza cutter, cut the dough into thin strips, as shown. Working with one cone at a time and starting from the bottom, wrap the cone with a strip of dough, slightly overlapping as you go and taking care to make sure that the tip is completely covered (to prevent leaks). Place cone, upside down, on your prepared baking sheet and keep chilled while you wrap the remaining cones (if desired, at this point you can brush with a little olive oil or melted butter and sprinkle with sugar or other toppings). Bake the cones for 15 minutes, or until golden brown. Cool cones on a tray or wire rack. 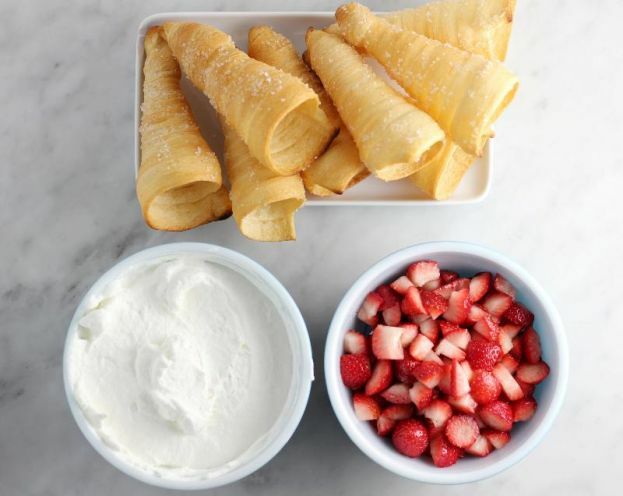 When cool, gently remove the baked crescent dough cones from the sugar cones and fill with your pre-prepared berries and cream and serve immediately. 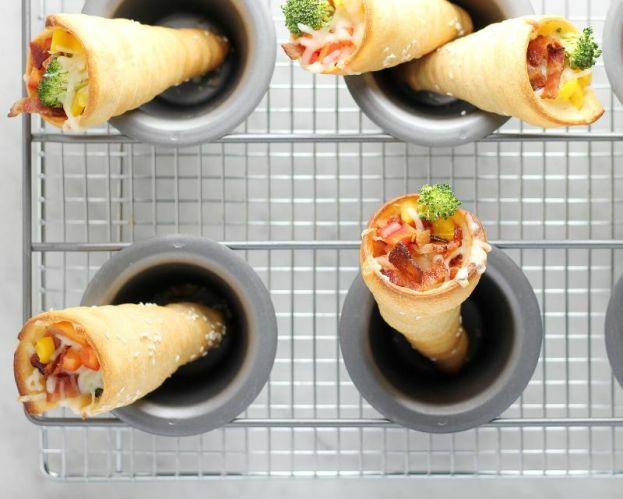 But here’s another great idea along the same line: Instead of filling these crescent dough cones with berries and cream, why not fill them with pizza ingredients? If you choose this route, you’d sprinkle the pre-baked cones with sea or kosher salt rather than sugar or other sweet toppings. 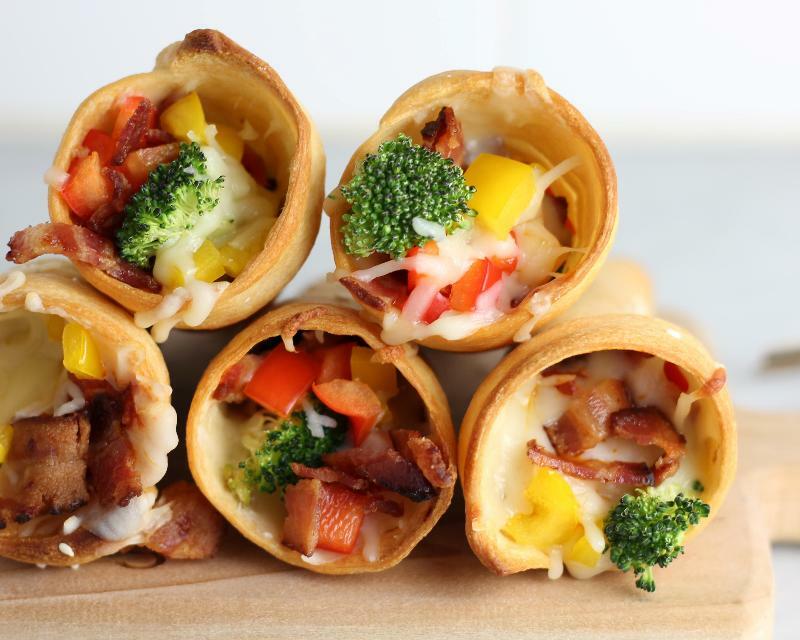 Fill baked cones with a bit of cheese to start, and then alternate with layers of sauce, fillings, and additional cheese. Place cones in ovenproof mugs or a popover rack (or just lay them on their sides on your baking tray). Return to oven for 5-10 minutes, or until cheese is melted. Serve immediately. Wouldn’t this be a fun main dish to serve at a weekend gathering? And really, this idea has all sorts of applications. For instance, besides berries and cream or pizza ingredients, how about filling them with Mac and cheese, whipped white or sweet potatoes, chili, ice cream or frozen yogurt, tapioca pudding and berries, chocolate or other flavored puddings, pie filling and a dollop of ice cream, or a pumpkin mousse? You’re limited only by your imagination. Let’s finish with the recipe and instructions for these cones. This is one we definitely want to include in our Cook’n repertoire. Oh, that clever crescent roll dough!